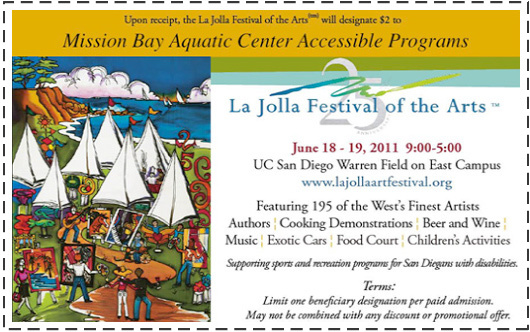 You can support accessible watersports (watersports for persons with disabilities) at MBAC by attending the La Jolla Festival of the Arts. Simply present the above beneficiary designation when you purchase your ticket at the fair and the Torrey Pines Kiwanis will donate $2 to benefit accssesible watersports at MBAC. The festival is a 2-day event held June 18 and 19 at the UCSD campus and is considered one of Southern California's premiere art festivals. In addition to 195 of the west's finest artists, the festival will feature cooking demonstrations, live music, and display of exotic cars each of which is a work of art in itself. All proceeds from the festival support sports programs for persons with disabilities throughout San Diego, including MBAC. In addition to the $2 donation per beneficiary designation collected, the festival raises money to sponsor accessible watersports as well as inclusion at The Watersports Camp, so children with disabilities can attend camp alongside their able-bodied peers. Last year over 400 persons with disabilities and their families enjoyed accessible watersports at MBAC.